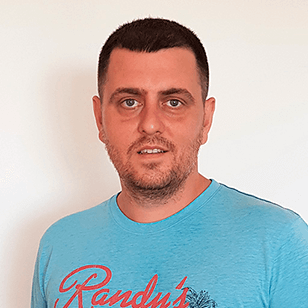 I'm a passionate web developer based in Varna, Bulgaria. Love spending time with my family. After so many years working for a huge company, having experience in team leadership, dealing with clients and problem solving, the time has come to try something new, something on my own. That's why I quit my job and I'm trying to set up my own company, a company that will make my clients happy, that will be able to handle every custom client inquiry. I believe in its success because it'll offer a different approach to every single client, the best approach to get the job done in time and get another happy client. Recently I was watching NG-CONF and I was amazed how easy is to build a desktop or mobile application using only a web technologies. That's why I started reading about some relatively new technologies like Angular, Vue, Node JS etc. I'm a huge fan of Kickstarter! I've always been curious how did the people are making things to work especially when they are working in completely different manner than before. My very first job was as 3D artist in a small company. This gave me a really good experience with all king of 3D software like Cinema 4D, 3Ds Max, Arhicad etc. At the moment this is just like a hobby. Invoice management SASS application made with Laravel 5.7 (Spark) and Angular 6+ that will offer clients management of their invoices and expenses. Integration with third party APIs and payment gateways, email and in App notifications. Still under development. New improved version of the BilligSelskab project made on top of Laravel 5.4 and frontend app build on top of Angular 5. The main goal here was to implement dynamic products that could handle company registrations as well as other products like Company registration changes, Loan, Changes at owner documents etc. Integration with third party APIs like Penneo and E-conomic. Stripe payment gateway integration. WordPress custom single page theme development. WordPress on demand image resize with the PHP well known Glide library. If you need different image sizes that are not added with WordPress add_image_size(...) you can use this package. Other use cases could be when you need really low quality image thumbnails for lazy loading, adding watermarks, image compression etc. Transliterate WordPress post slugs and media file names. If you are dealing with content data have non Ascii character like Bulgarian, Russian, German etc. and want to have all characters transliterated in slugs and file names you can use this package. One page website for the one of the most famous music video directors in Bulgaria. Build on top of WordPress. Corporate website for company making wooden and steel framing modular houses. WordPress custom theme and development. Corporate and brand identity company website. Custom theme build ot top of WordPress CMS. Construction company website built on top of WordPress implementing custom theme. Real estate company website and CRM built in Laravel framework. Implement hospitality expertise and quality standards for shipping companies. Built on top of WordPress implementing custom theme. Custom WordPress one page theme implementation for a dental practice website. Holiday rentals website. Build on top of WordPress having a custom design and theme development as well as promo flyers. Rally Bulgaria 2016 official website. The rally organization was very late with the website for the event and asked me to do my best and launch a new website for a few days. The only option was to use pre-made WordPress theme add a multi-language support and import as much as I can from the 2014th rally website because the last website was totally lost. Despite the fact that it's not the best-looking website the rally was awesome! Website for selling luxury, second hand vehicle. Full service project - from business cards, logo and web design to custom CMS solution for the backend. Laravel CRM solution that automates the jobs manually made before and handles the process of company registration in Denmark. It handles all the company registration requests, generates the appropriate documents required based on company type, sends and receives the documents to/from digital signature service, sends emails on certain conditions, connects to external API services to be able to create invoices, get company VAT number etc. Language school CRM application. Handles all the clients data, print contracts, statistics etc. The goal of the project was to limit the number of printed documents because of lack of storage space. Easily apply search criteria to Laravel 5 queries. When doing search forms, you always need to check and sanitize the data in the query string and apply different query constraints. When having a feature like that on every single listing page in your app this will become a very boring task. This package will try to do all the checks for you. Track user activities in Laravel 5 applications. The main idea is to store information (in a log or in a database) about who create, updated or deleted resources in Laravel application. When such event occurs the package will store the changed or deleted data. This will be useful if the data need to be reverted or diffs to be made. This package will store useful data for each user login in or logout. Create a data grid Bootstrap table from Laravel collection. The package will try to minimize the repeated task when creating a listing like table in Laravel. It will handle the data visualization and will add sort column headings and filters if required. If you need a user group based permissions and you want to define the permissions automatically from the protected routes, this will package will do it for you. Note that this package is tested only under Laravel 5.0. From version 5.1 and newer, better use Laravel Authorization layer! Store and share your files online. Responsible for project management, backend development and QA testing. CMS application for controlling websites content from a single place. The main goal was to limit the constantly repeating tasks of the content writers and to implement a system that is able to manage the content for many similar websites. Online GPS tracking application and fleet manager. The goal was to integrate really cheap Chinese GPS devices in the cars and to able to track the vehicles in real time with an option to do a route replays and find alternative paths between points on the map. As well as tracking it offers modules for vehicle maintenance, papers, fueling and accidents and alerts if some of the papers are out of date for example. It was base on open source source libraries like OpenStreetMap and Leaflet because Google Maps API costs a way too much. SaaS project for tracking website SEO ranking. Uses external API that provides the ranking data and displays it per keyword, website, position etc. Custom CMS solution giving the ability to control big part of the company websites (around 8000 at the moment) with a few clicks. Residential complex website. Integrate a high-resolution WIFI digital camera to be able to broadcast images on the web. At the time that the project has been made the high-resolution cameras was too expensive to be used for such a purpose and the client tries to minimize the hardware costs. Photo contest and voting system in Facebook. Online Music Lifestyle Magazine. Responsible for project management and QA Testing. Facebook promo game. Find the hidden junk and get discount. Facebook promo game. Invite your friends to the game get move chance to win a cleaner for a day.